Designed for all forms of handling, the Portwest Duo-Flex Latex Handling Purple and Blue Gloves A175U4 utilise double dipping techniques to offer maximum level water repellency for increased comfort and durability. Highly flexible and suitable for all conditions, the A175U4's provide secure grip for handling goods safely and securely. The highly adaptable Portwest Duo-Flex Latex Handling Purple and Blue Gloves A175R4 are suitable for both wet and dry environments meaning they can be used in a variety of situations from bricklaying to scaffolding. 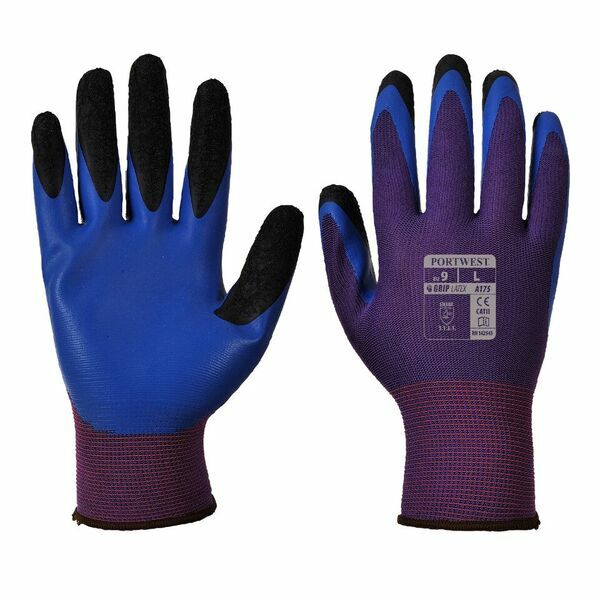 The Portwest Duo-Flex Latex Handling Purple and Blue Gloves A175R4 are available in sizes 8- 10. To find your perfect pair, please measure the circumference and length of your palm and match the results to the table below.